Raise the rubber boot up the mirror stem to expose the hex cinch nut (upper) and hex nut for the male mirror stud. While your mirrors are in the stock position, hold the lower nut with a wrench and loosen (do not remove) the upper cinch nut with another wrench. You should be able to turn the mirrors still attached to the handlebars 360 degrees at this point. You can see the upper cinch nut and the lower male stud nut in the picture below. IMPORTANT NOTE" The cinch nut on 2012+ DL650s and 2014+ DL1000 is a left hand thread. The part that screws into the handlebar stem (and into the mirror extender) is right hand thread. All other models use right hand threads for both the cinch nut and the posts. Unsrew the mirrors from the stock mount using a wrench. 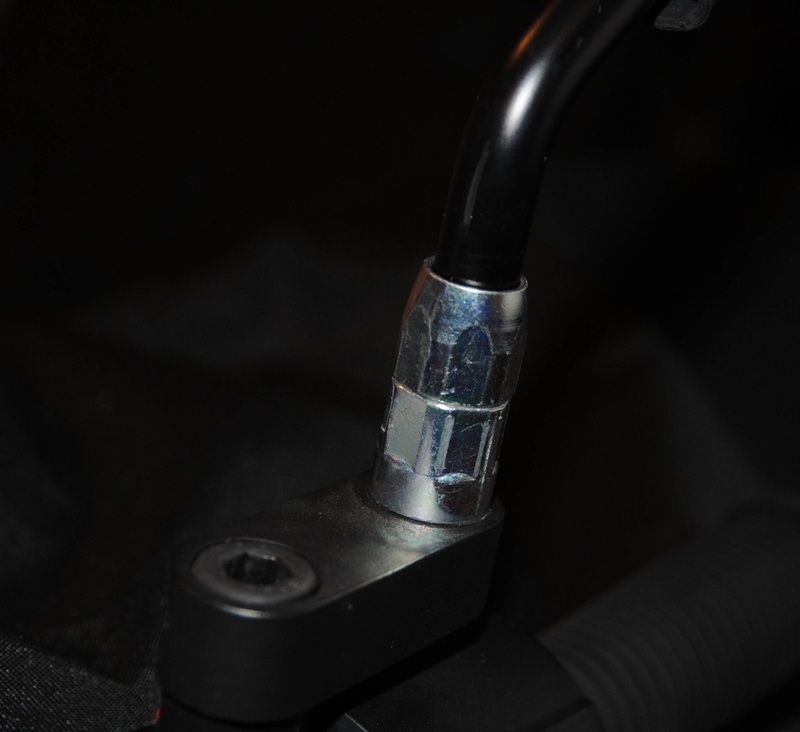 Place the mirror extenders on the stock mount and screw in the supplied allen screws loosely. Note for DL650 all years: the 20mm riser goes on teh left, the 10 mm riser on the right. No riser are used on the first generation DL1000. 20 mm risers are used on both sides of the 2014+ DL1000. Tighten up the allen socket head screw snug. Screw the mirrors into the extender tight. If your 2012+ DL650 or 2014+ DL1000 mirrors appear to have left hand threads, you removed the cinch nut instead of the male mirror stud that is probably still in your handlebar mirror stem. Holding the lower mirror nut with a wrench rotate the mirror clockwise to the desired postion.